COLORADO SPRINGS, Colo., March 19, 2018 /Christian Newswire/ -- Only a select group of athletes returned from the Winter Olympics with a medal, but many went back with a personal "lamp"--a free, special-edition Bible produced for the event. Sixteen thousand copies of the Triumph and Struggle Bible--in Korean, Russian, and Chinese, as well as English--were shipped to South Korea for distribution at the Games in a joint project by Biblica, the International Bible Society (www.biblica.com), and Athletes in Action (AIA, www.goAIA.org). The evangelistic gift featured a special insert with a Bible study designed for athletes, helping them discover how, as Psalm 119:105 puts it, God's Word is "a lamp unto my feet." It also presented testimonies by more than a dozen top Olympians. 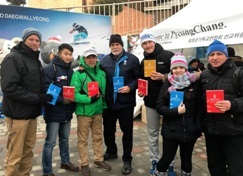 The colorful, hardback edition was distributed to athletes in the Olympic Village and at Games events in PyeongChang by a team of AIA workers, and also through local churches. One country coach took multiple copies, inserting a handwritten note in each for his athletes. From experience with outreaches at previous Games, AIA's Tim Pitcher knew there would be high interest from the athletes from almost 100 countries--some closed to the gospel. "It's a little bit of a good luck charm kind of thing," said Pitcher, AIA Pro Soccer Chief of Staff. Having produced special Scripture resources for previous Olympics, Biblica was delighted to be able to join with AIA for this outreach, said Laura Fisher, Biblica's Area Executive Director for North America. "We've seen how these materials have really made an impact in the past, and we are excited to see what God may do through our efforts in South Korea." The Triumph and Struggle Bible builds on previous Olympic efforts. Having previously used New Testaments, AIA decided for the summer Games in Brazil in 2016 that a full Bible would be more helpful, especially for athletes returning to countries where copies may not be easily available. The group turned to Biblica for help in producing the Struggle and Triumph edition first distributed in Brazil. That successful collaboration led to the edition being revised to be more appropriate for this year's Winter Games. Among the athletes who share their faith in the new version are Chinese speed skating coach Li Yan and U.S. athletes Lauryn Williams (bobsled) and Kelly Clark (snowboard). Others who stories are featured include runner Kellie Wells and Paralympian swimmer Daniel Dias. The non-English translations were not just for the Games. "Our Korean staff send a lot of missions trips into areas that speak those languages," said Pitcher. "Whatever Bibles are left over after the Olympics will continue to be used in sports and campus ministries and outreaches." AIA workers offered the Bibles at the worship service they hosted in the athletes' village, and when they met informally around the complex. "We tried to connect athletes with either a member of our staff or one of our partnering ministries in the country that they're from," said Pitcher. Those expressing interest were also pointed to the 30-day AIA "Struggle and Triumph" devotional app--available in 10 languages--on YouTube, the YouVersion Bible app and at the struggleandtriumph.com website. "We believe that this project has the potential to make a big impact not only in many individual lives, but as these athletes return home, in numerous countries too," said Fisher. "We know that when a Bible is placed into someone's hands, it has the power to change everything." Athletes In Action (AIA, www.goAIA.org) was founded in 1996 to share the gospel and disciple Christians through the "universal language" of sports. A ministry of Cru, formerly Campus Crusade for Christ, AIA is active in more than 90 countries.